For biorefineries to displace fossil fuels, a sustainable feedstock for microbial growth must be identified. As agricultural production of sugars has a limited capacity, it cannot completely replace fossil fuels without severely undermining food security and decreasing biodiversity. In order to fully displace fossil fuels we need to utilize resources that are essentially unlimited and that are independent of agricultural or forestry land use. 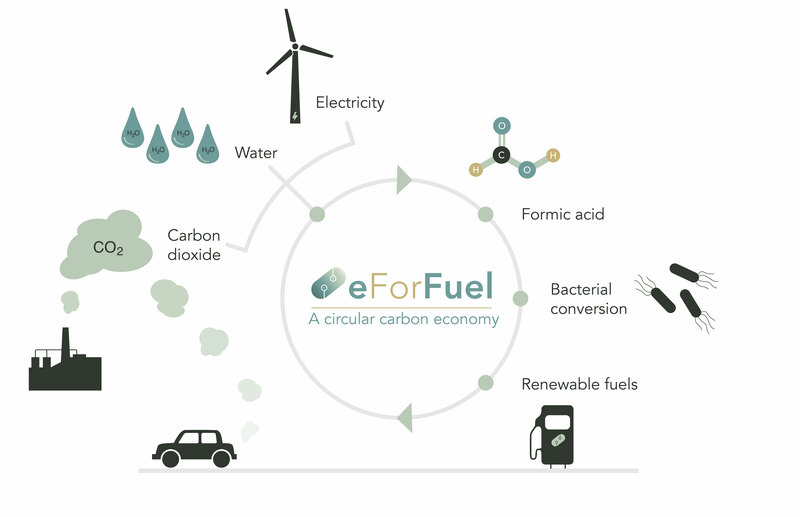 eForFuel develops an industrial biotechnology solution that uses electricity and microorganisms to convert CO2 into hydrocarbon fuels, thus providing a sustainable replacement of fossil carbons. We use the advantages of different disciplines to establish an efficient process: carbon dioxide activation via reduction to formic acid is performed via electrochemical means while production of hydrocarbons is carried out in formatotrophic microbes. eForFuel addresses multiple challenges previously limiting the success of novel fuel technologies. We decouple production from agricultural resources, instead relying on widely available resources, such as water, renewable electricity, and concentrated waste CO2 originating for example from the gas outflow of the steel industry. As a mediator between the electrochemical apparatus and microbial growth we use formic acid, which, unlike hydrogen and carbon monoxide, is fully soluble, easily stored and safe to handle. Our products, gaseous propane and isobutene, can be easily separated from the microbial culture, reducing production cost and increasing energy efficiency. Furthermore, the products can be easily integrated into existing fuel facilities: propane as component of LPG, and isobutene for production of the superb fuel substitute isooctane. eForFuel is a truly interdisciplinary consortium, bringing together experts from a wide spectrum of fields, including electrochemistry, material science, enzymology, biochemistry, microbiology, chemical engineering, industrial biotechnology, environmental science, and sociology. By focusing on integrated sustainability, eForFuel sets the stage for a future environmentally, economically, and societally sustainable value chain to produce renewable chemicals and fuels.